I have fond memories of the many fishing trips I took in my youth but the ones that seem to stick with me the most were those late spring crappie trips. With no limit in where I grew up, you could take home bushels. We didn’t fish crappie because they were exciting, we fished crappie because they were easy to catch and easily the best tasting panfish species. They are easy to catch and accept a wide variety of baits. Of course, having some proper crappie fishing tips will only improve your success! When we talk about crappie, we are referring to two species of panfish, the white crappie, and black crappie. Closely related to bluegill and sunfish, crappie are the largest members of what are commonly called panfish other than perch. The predominant diet of a crappie is composed of smaller fish but may include insects and crayfish depending on the environment. This makes them prone to taking a wide variety of baits and lures used by the modern angler. You will find crappie mostly slow-moving, clear water habitats like lakes, ponds, and some low-flow rivers and streams. While the record crappie was over 5 pounds, most crappie will reach lengths of about 8 inches and can weigh up to 2 pounds. They generally prefer vegetated habitats but may cluster around submerged trees and other cover where they feel safe. 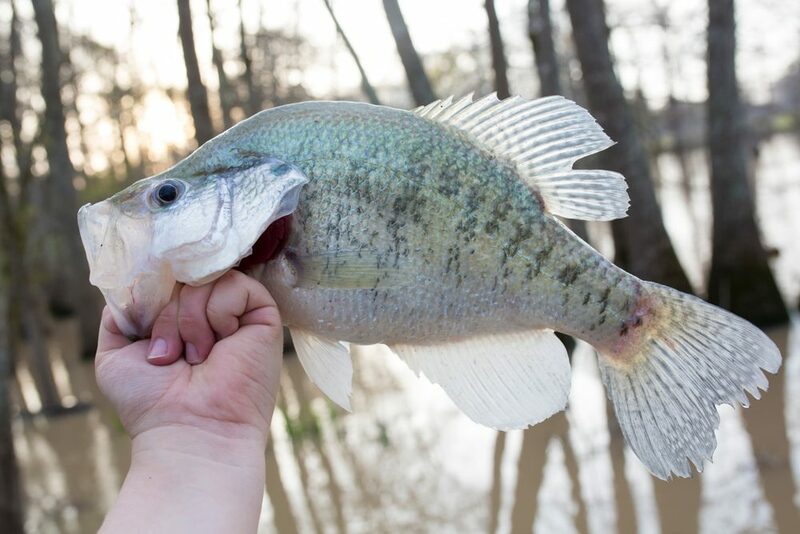 During the day, getting crappie to bite can be tricky but as they begin moving more in the early morning and evening, they are ready to feed. Often crappie will move closer to shore at these times but will still prefer cover. Though usually more active in warm water, crappie can be caught well into winter with some anglers catching them while ice fishing. Otherwise, spawning happens in March through June where fish will most actively feed. One of the beauties of crappie fishing is that it takes so little. You can have success for crappie on a cane pole or pretty much any rod and reel setup you prefer. During the spawn, even fly fishing can be productive in the right areas. Regardless of what setup you use, a faster action rod is preferred. Crappie are sometimes called papermouths due to their very week jaws. Some care needs to be taken to not rip the hook out of their mouth and even breaking their jaw bones. A preferred setup would be a lightweight spinning reel on an extra-fast or fast action rod. This is probably the most commonly used setup across the board for crappie. If you have to use a heavier rod, be cautious to set your hooks gently. Line weight can be very low with little risk of breaking or frightening fish. You can go as high as 8-pound test comfortably but 4 to 6 pound is often sufficient. A standard monofilament line is more than enough to do the job. You will also need all of the standard tackle such as floats, weights, and panfish or other small to medium hooks. Swivels can be used when needed for lures but aren’t necessary. Keep it as simple or as complex as you prefer. Much like anything else with Crappie, you can fish most baits and do well. Medium sized worms are a good choice when fished on a medium hook. This is a cheap go to that works every time! You can do the same with crickets, mill worms, and crayfish tails. These are very alluring baits for a variety of freshwater fish but will prove excellent for crappie. Crayfish tails are probably the single most effective bait to lure crappie out of hiding during full daylight. Still, the most popular and effective bait overall is a live minnow. Keep them small to appeal to the smaller size of a crappie compared to bass. Hooked through the back or lips, minnows will consistently produce more crappie than any other bait. The most common lures used for crappie are tube baits with a jig head. These can be bought in assortments at any fishing retailer for next to nothing. For the price, they are worth having but I have never found them the most useful lures. They do follow the general guidelines of what makes a good lure for crappie. You always want something that mimics their food source, preferably small minnows. There are a variety of lures that will do this better than tube baits. A personal favorite for casting is a small rooster tail or rooster tail spinner. The movement better mimics a minnow and can slay crappie in the right water. Opt for a light color with a little flash. I prefer white in most water conditions for crappie, even if the water is clear. You can also use these as a jig if you are in snags and you can’t do a proper cast and retrieve. This is a fairly effective method for fishing heavy weeds and downed trees. I have probably caught more crappie using this lure/method combination than any other. Though they aren’t popular with most anglers these days, I love a small silver spoon when I can cast and retrieve. Running these over weed beds is a very effective tactic for a variety of fish and works quite well for crappie. Small rubber grubs are a common go-to and are very cheap. These can be fished any way you prefer but the hook should be more to the rear of the bait. Crappie don’t feed as aggressively as bass and may not fully take the bait before you feel them tug. There are also several mimic baits that work quite well. Some are soft baits like Burkley’s Gulp line. These are a good choice when live baits aren’t an option. Drop shotting these like you do a bass is quite an effective method in tight spots. Some companies are making very small crank and swim baits that look quite promising. They work on a variety of panfish species and should do well with crappie. The major downfall with these is their likelihood of getting snagged. Crappie like very dense and tight spots and anything you have to crank much can get hung up quite easily. Panfish, in general, have a slew of techniques that can be effectively used. This depends on your personal setup and how you are fishing more than anything else. The location will have some bearing but not as much as your preferences and gear. The most common method employed by recreational fishermen is a minnow or other live bait on a bobber, usually around 2-6 feet deep. This is dropped into any convenient space in structure that is likely to have crappie. It is a nearly foolproof way to catch crappy and can be highly effective. Get the time of day and location right and you can quickly bring in a couple of dozen decent fish. This works with everything from a cane pole to a spinning rig and is a great way to introduce kids to fishing. If you are a cast and retrieve fisherman, you will need a little bit of accuracy. The idea is to run your lure right at the edge of structure or just at the tops of a weed bed. The closer the better but you can get decent fishing this way and even grab the occasional bass. I find this method to be frustrating and less effective than any other method of fishing. Of course, if you catch them as they are moving toward shore in open water, this can be a great method. You have to get the timing just right to catch them so know your water. Better than retrieval, if you insist on using lures try jigging. You don’t want to be on the bottom, usually anywhere from 10 feet to as little as 4 feet is a good depth for jigging. This same method can be used with most soft baits and if you get the method down, you can even jig with a spoon. When it comes to high production fishing, the common method is to use a number of rods cast in a circle around your boat. This is sometimes called Spider Rigging and done right, can catch you more crappie than you will ever care to fillet. Minnows are the preferred bait for this method. Hook them through the lip with a small split shot about a foot above them. The more you can get in the water, the more excitement you are likely to have. Many times, you will have multiple rods hitting at the same time so bring a friend or two. For the same reason as above, keep your line tight. Most likely the hook has caused a small tear in the crappie’s mouth. If you allow slack, that can often be enough for the crappie to shake the hook. Most of the time crappie will feed between 2 and 6 feet deep. The only time you are likely to find them deeper is when water temperatures are very high. In most cases, those fish won’t bite anyway. The exception to this rule is when they begin to move from deeper to shallower water in the evenings. Occasionally you will hook them between 8 and 10 feet deep. Crappie are known for their ease of starling. Don’t be too quick to cast and retrieve or drop your baits over and over. Keep it slow and easy, you are much more likely to be successful. The same holds true on your retrieve. Don’t crank like you are bass fishing. Crappie are more cautious and will often hold back before biting. Rarely will you ever need more than a 1/8 ounce bait or small minnow when fishing for crappie. These are perfectly sized compared to their normal food sources. You might get away with a little bigger but not much. Hooks should be similar sized and rarely need to be larger than a #6. You can get away with smaller. Avoid hooks that have large barbs that can needlessly cut the crappies small mouth. Save your aggressive hooks for more hard-skinned fish. Stick to the most sensitive rod you can. An extra-fast rod is the best bet but you can get by with a fast action rod. I would hesitate to go beyond this or it gets too easy to make your hook sets too hard. Gentle is better. For fly fishing, a 2 or 3 weight rod is perfect but anything above a 5 is too much. Because of the added length, getting too aggressive with a fly rod is very easy. Keep your rod as flexible and light as possible. Most cane poles are not rated so look for one with a slim, flexible tip. If you like the idea of a cane pole but want something more modern, consider a collapsible rod made for crappie fishing. They are nearly as much fun. If you aren’t getting any action, don’t be too quick to swap out baits. Sometimes crappie will have a very narrow zone where they are feeding. Move your lure or bait up or down a couple of feet and try again. Once you zone in, the fish will probably keep biting at that depth. The keeper limit on crappie is usually very generous if there is a limit at all. Crappie fishing should be fun and stress-free. Knowing the laws ahead of time can save you a lot of grief. The same holds true for fishing multiple poles. Some areas allow as many as you want to try while others only allow a single rod per fisherman. Whether you pick up one at your local shop for $10.00 or cut one on the way to the water, you should try cane pole fishing at least once in your life. It is simple, fun, and takes you back to the way your grandparents fished. Crappie can be as simple as 10 feet of line, a single hook and weight, a few worms, and a piece of cane. This is the ultimate of relaxation in a world that has grown more tech-heavy and complicated. It is a great thing to share with your kids or grandkids. Find a dock or submerged tree near the shore and spend an hour or two the old way. You will thank me afterward.